Airstrike Kills ISIS Leader Directly Linked To Paris Attackers : The Two-Way Charaffe al Mouadan, a Syrian-based ISIS member, had ties to suspected Paris mastermind Abdelhamid Abaaoud. Mouadan was among 10 ISIS militants killed in coalition strikes over the past month. 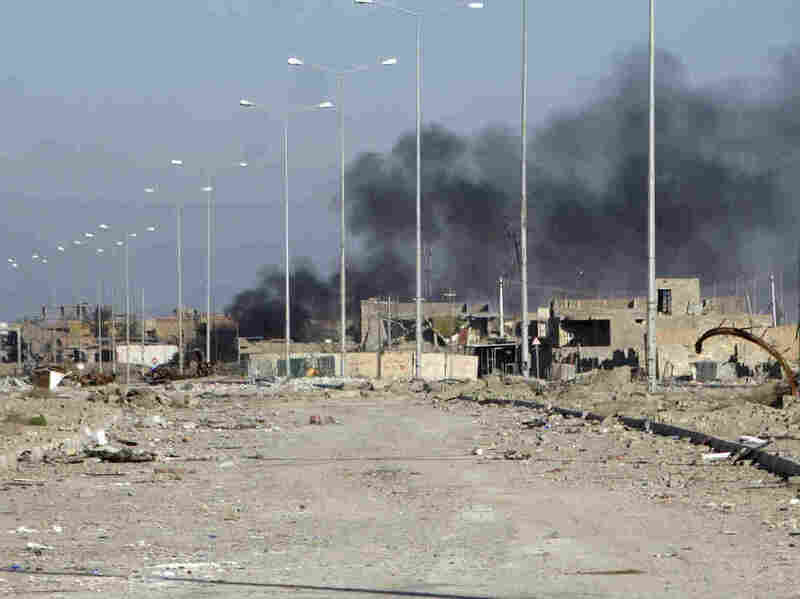 Smoke rises from ISIS positions following a U.S.-led coalition airstrike in the Huz neighborhood in downtown Ramadi, Iraq, on Saturday. A U.S. official said coalition airstrikes in Iraq and Syria have killed 10 ISIS leaders over the past month, including two militants with links to the terrorists behind the November attacks in Paris. U.S. Army Col. Steve Warren, a spokesman for the the coalition fighting ISIS, said an airstrike in Syria killed Charaffe al Mouadan, a Syrian-based ISIS member who was directly linked to Abdelhamid Abaaoud, the alleged mastermind of the Nov. 13 attacks in Paris that killed 130 people. Mouadan was actively planning attacks against the West, Warren said during a Pentagon briefing Tuesday. On Dec. 27, Tashin al-Hayali, an external operations facilitator, was killed near Mosul, Iraq. On Dec. 26, Abdel Kader Hakim, another ISIL external operations facilitator, was killed in Mosul, Iraq. Hakim was a veteran fighter and forgery specialist who had links to the Paris attack network. He was part of ISIL's external operations group who enabled attacks against Western targets. His death removes an important facilitator with many connections in Europe. On Dec. 24, Charaffe al Mouadan, a Syrian-based ISIL member with a direct link to Abdel Hamid Abaaoud, the Paris attack cell leader, was killed. Al Mouadan was actively planning additional attacks against the west. Dec. 12, Akram Muhammad Sa'ad Faris aka Akram Aabu, an ISIL commander and executioner, was killed near his base of operations in Tal Afar, Iraq. On Dec. 10, a Syria-based Bangladeshi, Siful Haque Sujan, was killed near Raqqah, Syria. Sujan was an external operations planner who was educated as a computer systems engineer in the United Kingdom. He supported ISIL's hacking efforts, anti-surveillance technology and weapons development. Now that he's dead, ISIL has lost a key link between networks. Also on Dec. 9, the coalition killed Mithaq Najim, ISIL's deputy emir in Kirkuk Province, near Hawijah, Iraq. Najim's removal disrupts ISIL's ability to train, command and maintain fighters in Kirkuk Province. On Dec. 9, the coalition killed Yunis Khalash, aka Abu Jawdat, ISIL's deputy financial emir in Mosul. His death will burden senior cadre to find a technically skilled and trustworthy replacement. Dec. 8, Abu Anas, an ISIL IED cell facilitator, was killed near Kirkuk, Iraq. His death will disrupt ISIL's ability to conduct IED attacks near Kirkuk. On Dec. 7, Khalil Ahmad Ali al-Wais, aka Abu Wadhah, the ISIL Amir of Kirkuk Province was killed near Hawijah, Iraq. Abu Wadhad had a long history of terrorist activities against U.S. and Iraqi forces. On Dec. 7, Rawand Dilsher Taher, an external operations facilitator, was killed near Raqqah, Syria. Taher was a trusted ISIL member who assisted with command and control as well as the handling and transferring of money and equipment. In addition to U.S.-led coalition airstrikes, the fight against ISIS is taking place on the ground. Iraqi troops have retaken much of the city of Ramadi from ISIS, as The Two-Way has reported. Although the militants have been pushed out of some cities and towns in both Syria and Iraq, ISIS remains in control of key areas. In Iraq, for example, the group still controls the cities of Mosul and Fallujah.